The month of Ramadan, with its unlimited blessings, can also be one which tires Muslims as they seek to move away from their normal daily lives just to enjoin the pleasure of Allah by praying, fasting from dawn to dusk and keeping away from all evil, showing utmost tolerance. The beginning of the month can thus be very busy and tiring for everyone but as the month passes Muslims get used to the routine and feel much at ease. In many households, the commencement of Ramadan is like a festival, where joy and happiness surrounds but the work is doubled as well as Muslims seek to enjoy the month to the fullest. Allah loves it when his creation celebrates the coming of Ramadan because it means that they appreciate the blessings that are coming their way. 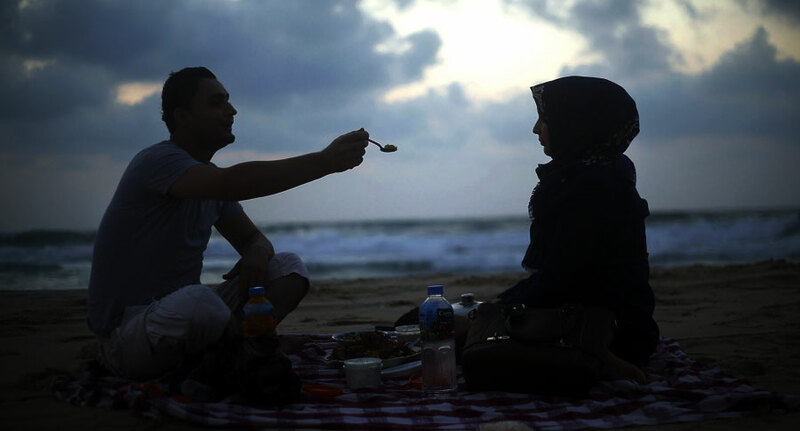 Muslim couples, before the month arrives and during it, realizing how busy the situation is, should play a major role in helping each other out during Ramadan. Helping the husband or helping the wife does not only mean completing each other’s tasks and sharing responsibilities, it also means supporting each other wholly. Muslim husband and wives helping in day to day activities is also an important part of Ramadan as what more does the month teach us than righteousness and kindness with each other. The wife should make an effort to share the emotional burdens of her husband after a tough day at work while he was fasting and offer him comfort. In the same way a husband should help the wife in her work that involves cooking at sehri and iftari. Not only that but the husband should also offer a helping hand in taking care of the kids, washing the dishes (there are many fried item dishes at iftari I’m sure! ), and cleaning up the house. The Holy Prophet (PBUH) used to help all his wives in their duties not only in Ramadan but all over the year, as narrated by Aisha (Rz). Being a constant pillar of support for your husband and wife during the month of Ramadan increases the love, respect and warmth they have for each other as they seek to please each other as well as Allah, realizing that in Ramadan, the reward is 70 times higher for any good deed. Another perfect way to help each other during Ramadan is to support each other in reading the Quran and praying together, for when 2 people pray together Allah blesses them much. If the husband and wife realize before the holy month commences that it will be busy and difficult and there is likelihood to not agree on things, they should plan in advance the responsibilities of Ramadan with each other. For example, the husband may agree to do the dishes in the morning and vice versa. These are little things but play a major part in not letting it become frustrating while you are fasting because alas we are humans, and hunger and thirst may get to us and we may get angry at little things. So we must make an utmost effort to help our spouses during this blessed month realizing that doing so during this month specially will be rewarded the highest!